Newport County's hopes of a League Two play-off spot were all but ended as they lost to an impressive Crewe. A superb individual opener by Harry McKirdy midway through the first half opened the scoring in front of a bumper crowd at Rodney Parade. Newport thought they should have had a penalty for a foul on Robbie Willmott before Jordan Bowery doubled the lead on the hour mark. Mickey Demetriou pulled a goal back, but Crewe held on for victory. 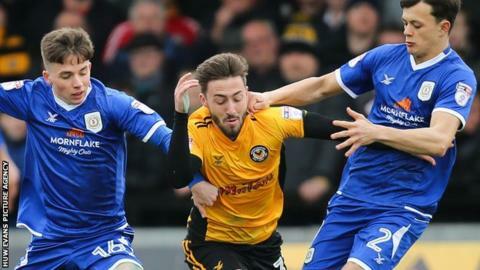 Newport County manager Michael Flynn told BBC Radio Wales: "It was disappointing, we didn't get started until the 79th minute and we got what we deserved. "I wasn't happy with the performance, every decision we made was wrong. "When we are the favourite we don't seem to be able to handle the expectation and that's something we need to work on." Match ends, Newport County 1, Crewe Alexandra 2. Second Half ends, Newport County 1, Crewe Alexandra 2. Attempt missed. Frank Nouble (Newport County) right footed shot from very close range is too high. Chris Dagnall (Crewe Alexandra) wins a free kick in the attacking half. Substitution, Crewe Alexandra. Michael Raynes replaces Charlie Kirk. Ben Tozer (Newport County) wins a free kick in the attacking half. Foul by Chris Dagnall (Crewe Alexandra). Foul by Frank Nouble (Newport County). Corner, Newport County. Conceded by George Ray. Perry Ng (Crewe Alexandra) is shown the yellow card for a bad foul. Goal! Newport County 1, Crewe Alexandra 2. Mickey Demetriou (Newport County) header from the right side of the six yard box to the centre of the goal. Assisted by Matthew Dolan with a cross. Frank Nouble (Newport County) wins a free kick in the attacking half. Corner, Crewe Alexandra. Conceded by Dan Butler. Substitution, Crewe Alexandra. Chris Dagnall replaces Harry McKirdy. Corner, Newport County. Conceded by Harry Pickering. Harry McKirdy (Crewe Alexandra) wins a free kick on the left wing. Corner, Newport County. Conceded by Eddie Nolan. Attempt blocked. Ben Tozer (Newport County) right footed shot from the centre of the box is blocked. Attempt blocked. Matthew Dolan (Newport County) right footed shot from outside the box is blocked. Substitution, Newport County. Shawn McCoulsky replaces Aaron Collins. Attempt missed. Matthew Dolan (Newport County) right footed shot from outside the box is close, but misses to the right. Corner, Newport County. Conceded by Charlie Kirk. Corner, Newport County. Conceded by Perry Ng. Attempt blocked. Paul Hayes (Newport County) right footed shot from a difficult angle on the left is blocked. Goal! Newport County 0, Crewe Alexandra 2. Jordan Bowery (Crewe Alexandra) left footed shot from the centre of the box to the centre of the goal. Paul Green (Crewe Alexandra) hits the right post with a left footed shot from the centre of the box. Substitution, Newport County. Frank Nouble replaces Josh Sheehan. Substitution, Newport County. Paul Hayes replaces Padraig Amond.